A fifteen minute drive north on I-25 from the Castle Pines community, and you may find yourself at the Landmark Center, an adult-outdoor playground filled with shopping, dining, entertainment, and Hapa Sushi Grill and Sake Bar. If you have not visited Hapa Sushi, you need to add it to your restaurant “to-go-to” list. The menu will surprise you and you will find yourself coming back for more. Hapa Sushi truly has something for everyone. Sushi lovers and non-sushi lovers will savor the Hawaiian-themed infusion of Asian and American cultures. For starters, try the melt-in-your-mouth sake garlic butter Sea Scallops stuffed with snow crab or the Colorado Style Hamachi, (Hamachi sashimi with fresh jalapenos, yuzu soy, and cilantro). Then move to a Hapa crowd pleaser, the Ruby Red Roll - a blend of cucumber and avocado wrapped in tuna, and drizzled with poke (pronounced po-kay) sauce. Another full of flavor dish is the Shrimp Tempura Roll topped with cream sauce. Hapa is a creative departure from ordinary sushi. Refreshing and unexpected combinations of fruit and fish that are unforgettable. Like the Statue of Liberty Roll (apples, avocado, kani and tuna), and top with strawberries for an added twist. Sushi fans will also find plenty of Nigiri and Sashimi choices. If sushi is not on your list of delectable favorites, Hapa features many other items on the menu to enjoy. To name a few, Hapa’s famous Kalua Pork (Hawaiian style oven roasted pork), the Thai Style Chicken Skewers, or the Hawaiian “Sticky Fingers” Ribs. Hapa offers seasonal specials as well, such as Copper River Salmon. You must end your meal with a treat from the dessert menu. The creamy Mochi Ice Cream, the Toffee Banana Bread served warm with Hapa’s house made toffee sauce, or the scrumptious Banana Tempura Split are all highly recommended. Make it a date night or bring the kids - they won’t feel left out because Hapa features a menu especially for younger diners. Hapa puts a spin on an “oldie but goodie” with Austin’s PB and J Roll (peanut butter and jelly rolled in a slice of bread), which can be topped with whipped cream. Or offer them the more traditional Hapa’s Teriyaki Chicken or Remy’s Teriyaki Beef entree served with rice. Saving the best for last, Hapa wraps up the kid’s menu with fun Rice Crispy Treat Sushi (yes, it is a dessert). Colorful assortments of Swedish fish candies are served over rice crispy treat squares in true sushi and nigiri style. There’s even a Rice Crispy Treat roll filled with gummy treats and sliced like traditional sushi and wrapped in fruit leather. Adults have been known to order this treat for themselves! A fun and lip-smacking introduction to the sushi world, you can literally feed the whole family. For those with wheat sensitivities, Hapa Sushi now offers a gluten-free menu. With their cool vibe, hip atmosphere and excellent service, Hapa Sushi has a great happy hour, lunch and dinner crowd. Dine in the contemporary dining room or the lounge where you can watch the flat screen TV, or the outside patio while enjoying a great selection of sake as well as other drinks from the bar. Happy hour at Hapa Sushi runs every day except Sundays from 2:30 p.m. to 5:30 p.m. and a late happy hour on Thursdays, Fridays, and Saturdays from 10:00 p.m. to 12:00 a.m. The happy hour menu will not disappoint with a tasty display of food and drink specials. Try the Kalua Pork Sliders and Mango Gin Ginger sake cocktail (mango infused sake with gin and ginger ale). Extend your enjoyment by taking a stroll to the Comedy Works, the Landmark Theatre or to Chez Cirque for its dueling pianos. Take your time and make an evening of it. Hapa’s hours of operation are 11 a.m. to 10 p.m. Sunday through Wednesday, and 11 a.m. to midnight Thursday through Saturday. Hapa Sushi is located at 5380 Greenwood Plaza Boulevard at the Landmark Center in Greenwood Village. For more information, please call 303-267-8744 or visit www.hapasushi.com. 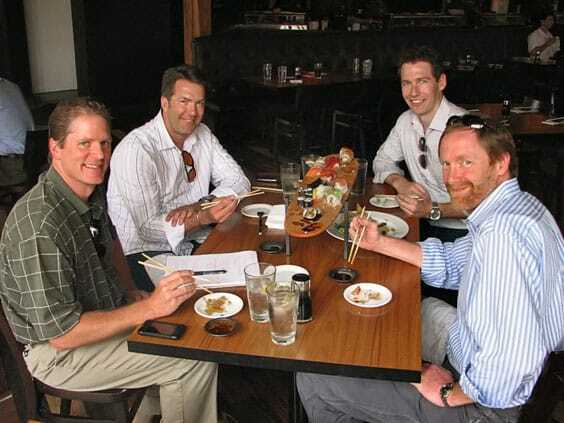 Lunch goers take a break from their working lunch meeting to enjoy a sushi surf board at Hapa Sushi Grill nd Sake Bar at the Landmark.